Rear Admiral Grace Murray Hopper was one of the first programmers of the Harvard Mark 1 computer and invented the first computer language compiler, leading to the development of the COBOL programming language. Students who had yet to meet each other bonded on the trip. In 2017, attendance at GHC hit a record 18,000. 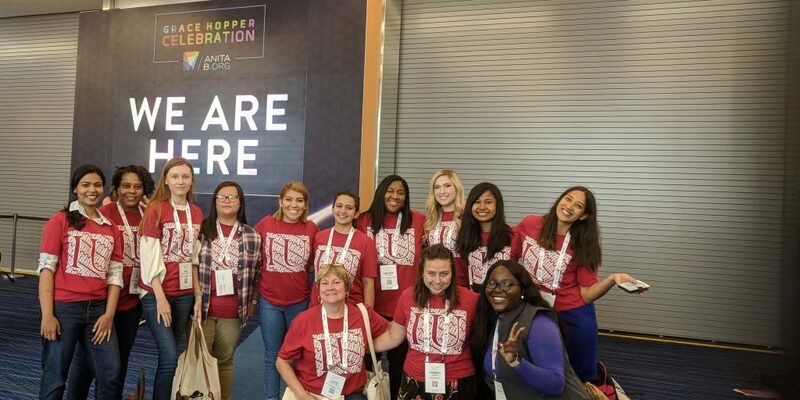 This year’s celebration, held in Houston, hosted close to 20,000 attendees that included fourteen women and two staff members from IUPUI. Vicki Daugherty, Program Manager and Diversity Coordinator, and Pat Rhodes, Career Services Specialist, both from the School of Informatics and Computing at IUPUI, accompanied the group this year. Among the highlights: One current student was offered a job on the spot, and a former student was seen recruiting for her new employer, Accenture. Yet another SoIC alumna, who attended GHC as a student and is now an assistant professor at the University of Illinois, returned with her own students this year. When you hear staff and students alike speak of Grace in an awed, almost reverent tone, you know it must be something special. Notably, it is the largest gathering of women technologists in the world. Presented by the Anita Borg Institute for Women in Technology and the Association for Computing Machinery, and sponsored by Computing Research Association-Women, the three-day conference is designed to bring together women in computing to discuss research and career interests. But beyond the sheer size and spectacle of “Amazing” Grace is the deep, meaningful connection that the event provides to women of all professional levels. Their personal stories reflect the lasting impact that Grace, and the eponymous Grace Hopper, has made in their lives and on their futures. Amanda Echegaray attended a Google event at GHC. Daugherty and Rhodes help prepare the students for their participation. “Attendance in 2015 was 15K—immense. We talked about Grace with past participants about how to make the most of the experience,” said Daugherty. She encourages students to apply for conference scholarships and to submit posters. Scholarships are supported by industry sponsors, which gives extra access. Rhodes advises on preparation for the GHC Career Fair, reviewing resumes, and tips and strategies on negotiating offers. Another piece of advice: posting resumes to the online database can lead to invites to industry receptions and job interviews. Daugherty points to two IUPUI informatics alumnae who made important connections at Grace. Chelsea Bedel, whose sister Bridget is a current student at the school, interviewed with MasterCard at GHC, obtained a summer internship, and was offered a job before graduating in 2014. While working as an analyst at MasterCard, Bedel went back to Grace in 2015 and invited the IUPUI women to a MasterCard reception. Another alumna, Sarah (Parker) Raheja, went to Grace as a junior. Representatives of the General Electric IT leadership program saw her resume online and hired her into their program. Parker now works for GE in Atlanta as a senior UX designer and blogs about why Grace is so important to women in IT. In fall 2016, 10 IUPUI informatics women, along with Rhodes and former career advisor Stephanie Marshall, attended GHC. Professor Sara Anne Hook also attended and presented with graduate student Cori Faklaris at a student opportunity lab. Students Hanlin Li and Adriana Alvarado Garcia each presented research posters. “As a student looking for a Ph.D. program, I benefited from GHC because I got the opportunity to talk with Ph.D. students and scholars coming from different universities and know more about their programs,” Li said. Years after her career in IT ended, Grace Murray Hopper’s legacy and influence lives on at GHC. And the IUPUI scholarships will continue to give our students the opportunity to meet others in their field, learn important lessons from women who’ve made it, and make ongoing contacts that may help launch their careers.